Recruiting to fill a new position at a company is no easy task, but a simple way to start gathering interest is by creating a job recruiting campaign to post on various social profiles. Collecting submissions through social channels means that those who are already interested in your brand will be the first to put their hat in the ring. According to job recruitment tool Jobvite, 94% of recruiters use social media for recruiting. And “employers who used social media to hire found a 49% improvement in candidate quality over candidates sourced only through traditional recruiting channels.” Using social media to bring new people to your company helps simplify the hiring process, and can help target the most qualified candidates more quickly since people are coming directly to you. With ShortStack, building a job recruiting Campaign is simple. Add an eye-catching header graphic (which you can do using our built-in Canva integration), share some information about your company and what you’re seeking, and create a form to collect specific information from applicants. ShortStack’s Landing Page Form template has everything needed to get started. Make fields required. Select a field within the Form Designer and check the “Required” checkbox to ensure that visitors fill out each field on your form. Post your recruitment landing page on multiple social profiles. Beyond LinkedIn, which is currently the most effective social service for recruiting employees, Facebook and Twitter are also useful social networks to post the recruitment page. Use targeted ads to direct the landing page to specific demographics. If you’re seeking responses from people in a specific location or industry, creating a targeted Facebook or LinkedIn ad will boost the exposure of the recruitment Campaign to that audience. Include specific fields to help identify ideal candidates. Within the Form Designer, there are several types of field options, including checkboxes, drop-down menu items and radio buttons. Use these different fields to ask preliminary questions of potential candidates. For instance, include a drop-down menu to find out if the interested person is looking for full-time or part-time work. When this information is stored in your database, you can export it and filter the responses by field. 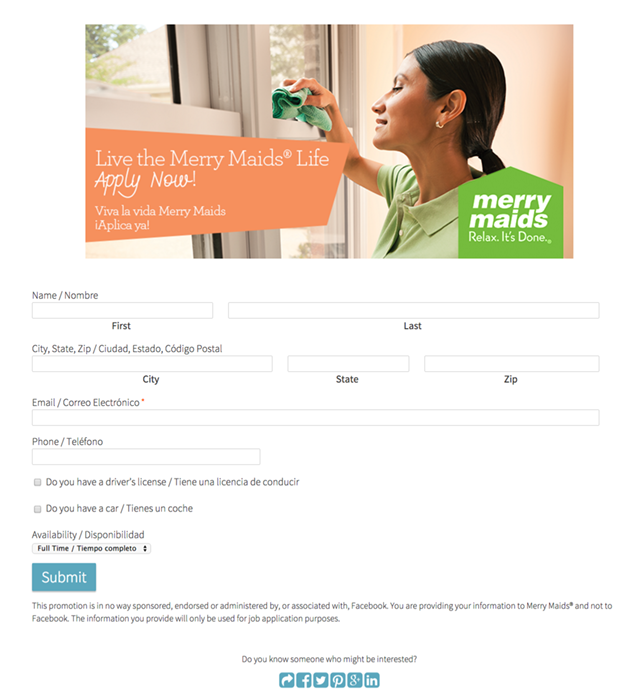 Merry Maids created a clean and vibrant job recruiting Campaign to generate interest in applying to their company. They took advantage of editing field labels within the Form Designer to create a bilingual Campaign in English and in Spanish. This Campaign includes a cheery header image containing their call to action (“Apply now!”), and a form to collect some basic information from visitors. Need help creating your job recruiting Campaign? Contact our awesome support crew at theteam@shortstacklab.com.